A Arduino board has to be programmed depending on the way you want to use it. It will do nothing at all if you don’t upload any program in it. Even though the board is not “active” when used as a footcontroler for triggering effects for the guitar in Pure Data, it stills requires some programming to know what it should “listen” to (that is, how many pins are connected and what type of input should they expect), and what it should to when a particular event happens (send a message to the computer when a button is pressed, for instance). In order to upload a program in your Arduino board, you will need to download and install the Arduino software (or IDE, for “Integrated Development Environment”). 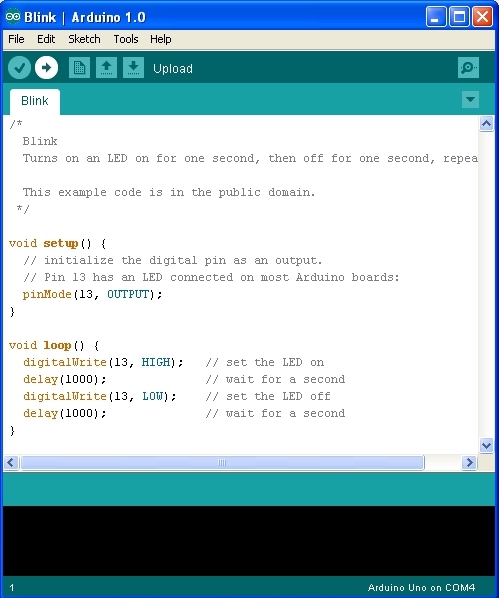 You can download it from the Arduino official website. You can now plug your Arduino board. Go to “Tools > Board” and select your model. You may also have to select the port to which your board is connected if you get an error while uploading a sketch. To do so, go to “Tools > Serial Port” and select another port. The Arduino IDE comes bundled with many examples. If you want to make sure that your board is working fine without having to add any electronic parts, go to “File > Examples > 1.Basics > Blink”. 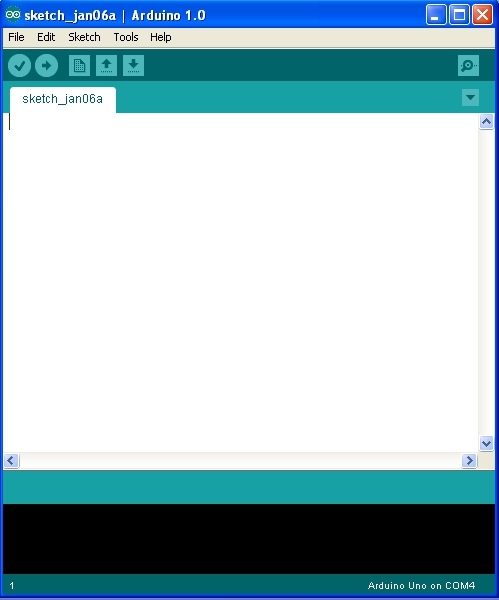 You should now see the (very simple) code instead of a blank sketch (see image below). In order to upload the sketch to your board click on the rightward arrow button (the one highlighted in the image below). If all goes well the tiny LED close to Pin 13 on your board should now be blinking slowly. You can find more examples on the Arduino website. For Linux users : and Arduino Uno owners! Until recently this board was “broken” in Linux. Fortunately there is a fix. It requires flashing the firmware, but it’s not difficult to do. I wrote a detailed how-to about this fix that you can read on the official Pd website. Once your board is up-and-running and you know how to upload some code to it, you can upload Firmata by going to “Files > Examples > Firmata” (TO BE CONFIRMED…) and selecting StandardFirmata. Upload it and your board is now ready to talk with the [Pduino] object in Pd. You may proceed to the post explaining how to install and use [Pduino]. This entry was posted in Arduino and tagged arduino, diy, guitar, IDE, pduino, pedal. Bookmark the permalink. Firts, congratulations for the blog. Te question: I’m a composer and I wanna try to connect a Line6 POD X3 live to PD. It will be necessary use arduino to? Do you know another way to conect this pedal to PD? I don’t know the POD X3 but it seems like the USB is only for recording the ouput of the pedal with a computer. So the only thing you could do with Pd is use the output and process it, but you’d need a soundcard if you want to plug the output into an amp for instance. I’m pretty sure you won’t be able to use the buttons on your pedal to control a Pd patch. What you will need if you want to control a patch from a pedal is either a custom pedal based on an arduino (like mine), or a midi pedal, which should also work fine in Pd. The pedals that actually do some DSP like multi-effects are most of the time unusable in Pd.